The Beat goes off. These words are hard to type even though those of us associated with the magazine or its heroic editor, CC Smith, knew the end was near. Like so many print publications that have been cozy-robe-and-slippers for all these many years, The Beat couldn't survive the economic downturn that killed or wounded its base of advertisers. It's the usual scenario: the many suffer from the carelessness and greed of a few. 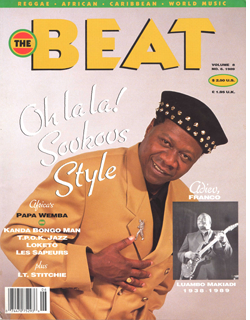 I first heard of the magazine when listening to founding editor Roger Steffens on his syndicated Reggae Beat radio program, back in the days of Cliff and Marley and the Maytals. Roger sent me digging for treasure in the vinyl bins of southeastern Michigan where I once lived (surprisingly, there was much to be found there). While Roger got me reading The Beat, C.C. Smith hooked me as a writer. I had gotten my writing start with West Africa magazine, but thanks to C.C. I found a nurturing home at The Beat. She was all an editor should be: creative, supportive, and exacting. With her encouragement I was able to write about so much that interested me without regard to the constraints of mainstream journalism. If there had been no Beat magazine my books would likely have lingered as ideas unfulfilled in the back of an otherwise unfocused mind. Several of the chapters of Breakout found a first home as articles in The Beat. It was partly a result of C.C. 's persistent encouragement that Rumba on the River came to fruition; in fact, a late-night conversation with her led me to the title. Writing for The Beat was almost as much fun as reading it. The look of the printed magazine was dazzling, thanks to Donna Tarzian and later Jose Legaspi. And the writers were terrific, both knowledgeable and enthusiastic. So many wonderful people contributed over the magazine's nearly thirty years. I hope I can single out a few of my favorites—Roger Steffens (of course), Bob Tarte, Michael Turner, Martin Sinnock, Doug Wendt, Tom Cheyney, Jimmy Hori, Gene Scaramuzzo, Ron Sakolsky—without it taking away from all the others who made The Beat such an enjoyable, worthwhile read. Yes, I guess I saw the end coming, but that doesn't make it any easier to say good-bye. I'll miss you C.C. and Roger and the beautiful, tactile, informative printed pages that you produced and I curled up with for so many years. I'm grateful for all you did to enrich my intellectual life. Thanks and farewell and best wishes for whatever lies ahead.